Happy Spring to you. I hope that all is going great and that you have had a truly wonderful start to 2017. I missed writing a New Year Blog to you, so let me take a moment now to wish you the happiest 2017, in every single aspect, area and element of your life. May this year be your absolute best year yet. The theme of this Blog has been my own work in progress or work in practice, since the New Year because I’ve themed this year a year to “Tread Softly” and this is what I have focusing on in as many moments as I can, day by day, since the New Year dawned. Let me explain … a few years back, I wrote a blog about giving your year a theme, as at that time, I found it was a powerful way to help me stay constant, focused and plugged in to what I wanted to create and how I wanted to be. Fast forward to this year and I’m theme-ing my year again, so I have created the mantra or motto “Tread Softly” to help guide my daily actions in both work and in life. 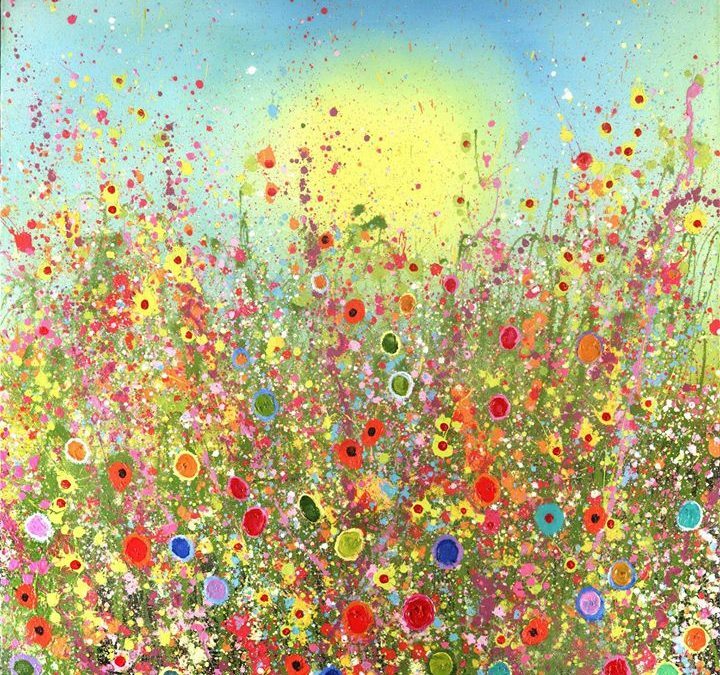 I got those two beautiful words “Tread Softly” from a painting by a talented artist called Yvonne Coomber when I went to visit the Gaslamp Gallery in Gorey, Co. Wexford, Ireland, in September last year with my husband Phil. We were looking at the various paintings on display in the gallery when I stopped in front of this particular one (and yes the painting is the image in this Blog and here is a link to Yvonne’s art work. I loved it instantly with its bursts of colours and flowers and the sun shining out from the centre of it but I loved it even more when I saw the name of the painting displayed underneath as “Tread Softly”. In fact, it immediately brought tears to my eyes. Why? Because in addition to the paintings beauty, I linked the words to the final line in the W.B. Yeats Poem “Cloths of Heaven”, which is “Tread softly because you tread on my dreams”. So, as I stood in front of the painting, with tears in my eyes in a gallery, in public, wondering why I was crying, I softened my heart and realised that those words were significant because they were speaking directly to me about how to tread softly … and gently … and lightly … and with kindness … and tenderness … and love … and ease … on my journey to my own big dreams. So I’ve kept those words with me as a gentle but powerful reminder of how I can be in the pursuit of my big goals and in the little moments along the way. And with my new theme and daily focus, here’s what I have found so far. I’ve noticed how many ideas I get, lovely creative sparks of ideas to help me move forward on the road of my goals. But I’ve also noticed how quick my mind has been to tread them down, often, almost as quickly as they rise up. So my main practise now is to tread softly in the pathways of my own mind by acknowledging the progress that I am making, talking kindly and softly to myself from the first moment I wake up, intentionally choosing to feel good and consciously looking for things to appreciate, like the good night’s sleep, the cosiness of my bed, the warmth of the snuggles from my boys, a picture being drawn for me by my four year old of me standing under a rainbow, a phonecall where I can support an upset friend, a really powerful coaching session, a hearty laugh with my Mam, a chance to practise yoga even if it’s just for ten minutes and the list goes on and on. And I’m meditating now more than ever, morning and also often at night time and what I’ve noticed is that this is the core practise that helps me soften my mind and my thoughts. Meditating, for me, even if it’s just for a few minutes, dissolves any sharp edges in my thinking, allows inspired actions to come with clarity to the surface of my mind, and resets and refocuses me. And do you know what? I’ve never had a better January – personally and professionally. This new way of focusing and treading softly in the direction of my dreams has helped me build momentum, enjoyment and fun into all I am doing – even the smallest of actions on the pathway to my biggest ever dreams. So … what about you? How might you tread more softly this year? And what about treading on others dreams? So, back to the poem for a moment, because this treading softly is not just an inside journey. It’s interesting that in the poem, Yeats is not actually talking to himself about treading softly on his own dreams, but rather, he is speaking to his lover. He wishes he could give her the “heavens embroidered cloths” but as he is “poor“, he has only his dreams to “spread beneath [her] feet” and so he asks her to walk gently on them. How beautiful! To be mindful of the gift of another’s dreams! Because a dream or a creative idea is such a precious thing, a sacred offering from the inner workings of the imagination. It’s tender and fragile and like a little flicker of light, it can be extinguished so quickly and easily and even unintentionally. I remember doing a Business Course many years ago, and the facilitator, an inspirational lady called Veronica Canning, talked to us about being careful of who you share your ideas for starting new businesses or ventures with. She referred to the idea as being embryonic and I thought this was a really powerful metaphor as it depicted the vulnerability of the idea at that early stage, where the dream is just forming, sometimes scarcely tangible, maybe just a whisper of something that feels important, exciting and vaguely possible to you. Then you share it with someone else, as you try to make sense of it, try to make it explicit or look for support on it, but in the wrong hands, or under the wrong feet, your dream may inadvertently be trampled down. So, give a moment’s thought to how you respond to other people’s creativity and ideas – maybe at work, at a meeting or even with your family or children with their ideas about things they would like to do, goals they would like to pursue. That’s them laying their dreams out under your feet. Do you fan the spark of their creativity, do you nurture their imaginings, do you support their ideas to catch fire, do you also wish for the expansion of what might be possible or do you trample on their tender thoughts of hope and inspiration? I remember last year at a Leadership Forum that I was facilitating that one senior leader in the business shared how powerful it had been for him to learn to “shut-up and listen” and he went on to tell us about how at one meeting, when he was practising listening rather than talking, that one of his team voiced an idea that subsequently went on to become one of the biggest selling and most successful products for the company. So, let this be a gentle reminder to us all to be attentive about how we listen and nurture the field of each others dreams. I know there are a few themes in this Blog, and I would like to finish with this final one. February 1st, the first day of Spring here in Ireland was the feast of St. Brigid, our female Patron Saint. I was reminded on that day of the story of when she met with the King of Leinster to ask him to give her land to set up a convent. The story goes that he refused to give her any so she asked him if he would give her the amount of land that her cloak would cover. On seeing her meagre sized cloak, he agreed and when she laid the cloth on the ground, legend says that it expanded to cover acres and acres of green, that we know today as The Curragh in Co. Kildare. The King honoured his word and she founded her convent there. It’s a powerful story, isn’t it, to illustrate the power of laying your dream down, of believing in it and treading softly over what you have spread out so that it continues to grow and expand. So, begin if you can now, to picture the dreams that you have spread under your feet. How far do they reach in front, behind and out the side of you? What colour are your dreams? How many different embroidered cloths and tapestries can you create? Can you see now, in your mind’s eye, how they touch and connect with other people’s dreams? And can you visualise someone you know whose dreams may be pale and dim and who with a bit of space and support from you, could fill and flood them with energy and colour to allow them to grow and expand? This year, my wish for you and for me is that we can tread softly on our dreams and on the dreams of others and that in so doing, we notice how rapidly and easily they expand.